This is one of my go-to recipes for so many reasons – it’s nutritional, easy, quick, delicious… and that’s just to name a few. It’s also served me through so many different stages of life from exercising & focusing on my nutrition to early pregnancy when I couldn’t stand to see/smell/eat meat, and now to late pregnancy when my appetite just isn’t there and all I want to drink are smoothies (I’m sure many of you can relate)! I’m not going to sit here and pretend like I know everything there is to know about nutrition and why I put what I do in the smoothie – I just know it’s good stuff and I like the way it tastes so WHAM – recipe! I apologize for those of you who have recipe OCD and need to follow it to a T (that’s never really been my style). I told you, this wasn’t going to be super science-y and overly nutritional fact based either. 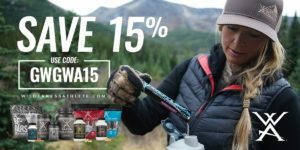 Like I said – I know it tastes good and I trust the team at Wilderness Athlete to handle the nutritional side and provide high-quality products that are good for my body. As always though, just do a double check with your doc when adding in supplements, especially for any preggos like me where nutrition is extra, extra important! Dump it all in & blend! Depending on how thick or runny you like your smoothies, you can do a taste test and add more milk, ice, etc to get the consistency you prefer. Sometimes I’ll just pour & drink right away, or throw it in an insulated tumbler and stick it in the fridge at work, where it’s still the perfect consistency for my lunch! 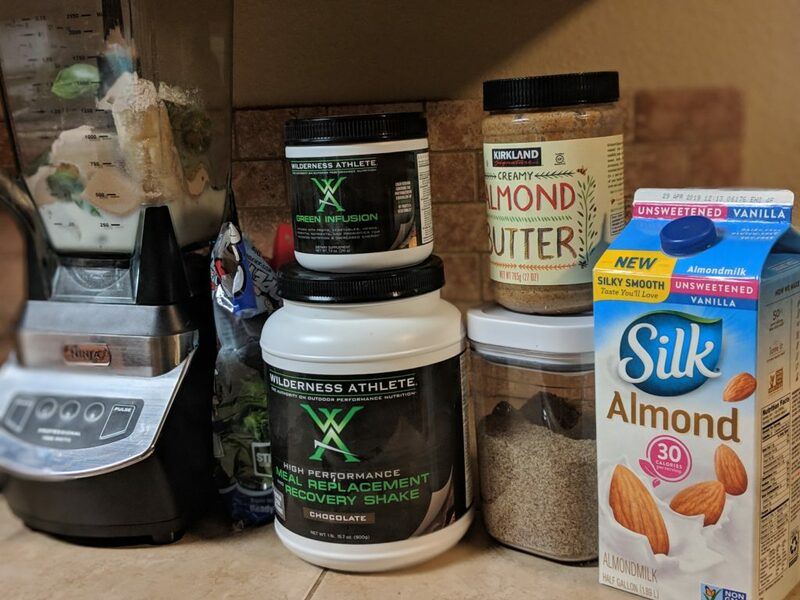 -The Meal Replacement and Recovery Protein Powder is delicious in blended smoothies, but I also drink it just shaken with milk or water in a blender bottle (I prefer milk, but the water isn’t terrible in a situation where you’re trying to get something healthy in your body and options are limited). -I’ve also tried the Meal Replacement in Strawberry flavor, and when you mix it with milk, it no joke tastes like the fruity milk you would drink out of the bottom of your cereal bowl as a kid. Talk about delicious (and way more guilt free than that oh so tasty sugary cereal). -I personally have a hard time with the taste of Green Infusion, but when something has the equivalent of 6 fruits and veggies (which I’ve found just isn’t possible some days), it’s worth it. I prefer the Green Infusion blended into a smoothie like this with lots of other strong flavors (banana, pb & chocolate) and I don’t even notice the taste! 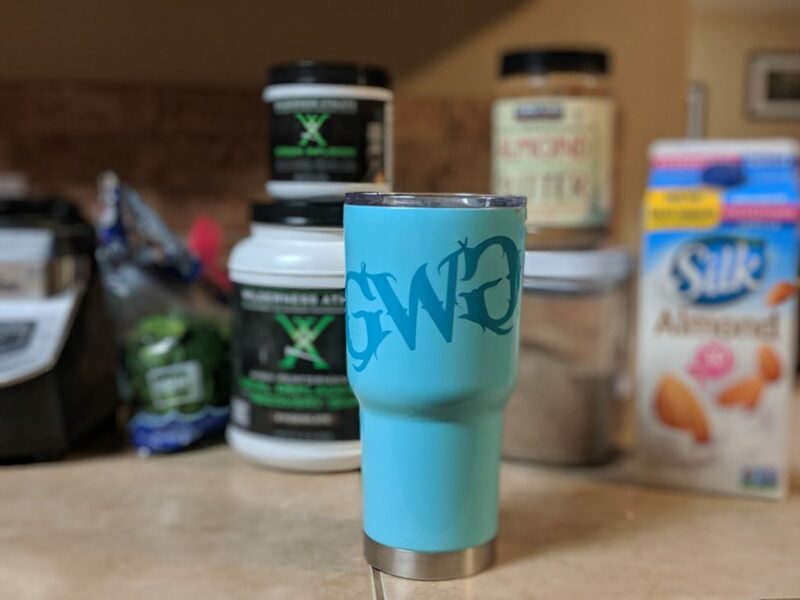 -While I haven’t tried it yet, Wilderness Athlete just launched a new Wild C8 MCT Powder that I’m definitely going to be adding in to my smoothies and/or other daily drinks. Again, I’ll leave the science-y stuff to them but it’s good for ya! Thanks for checking out my recipe! If you tried it or have something similar you like to blend up, let me know in the comments below! If you’re looking for other recipes on the GWG blog, check them out here.